Thoracolumbar injuries presenting in a delayed manner are uncommon, and their etiologies are varied ranging from missed injuries, wrong initial management, and delayed presentation for treatment. While improvements in healthcare awareness and delivery systems worldwide have improved the acute management of spinal injuries, the diagnosis and management of delayed spinal injuries remains a challenge to the treating physician regarding intraoperative difficulties, perioperative complications, and subsequent rehabilitation. Sequel of delayed presentation such as neurological deficit, spinal deformity, capsular contractures, muscle wasting, pulmonary and urinary tract infections and pressure sores have a significant bearing on the outcomes of management of delayed spinal trauma. Indications for surgical management include axial pain, neurological deficit, and kyphotic deformity. Management options include anterior corpectomy and fusion, combined anterior posterior surgery, and an all-posterior spinal decompression and deformity correction. With increased access to healthcare and refinements in emergency and specialized trauma care, the diagnosis and management of spinal injuries have significantly improved in the last few decades. However, for reasons including poor initial care, missed injuries and neglect of patient due to socioeconomic reasons, spinal injuries can present late to the treating surgeons. Missed injuries or delayed management of spinal trauma can have less desirable outcomes as compared to injuries managed primarily., Complications including neurological deficit, spinal deformity, pulmonary and urinary tract infections, and pressure sores can portend suboptimal outcomes in the management of delayed spinal trauma. In this narrative review the epidemiology, pathophysiology, assessment, and management of delayed thoracolumbar (TL) trauma have been discussed. The incidence of TL trauma with delayed presentation varies from 5% to 40%.,,, In a prospective study of 274 patients with spinal trauma, Reid et al. observed that 4.9% of the patients with TL injuries had a delayed diagnosis, while the incidence of missed cervical spine injuries in their study was much higher at 22.9%. The incidence of missed cervical spine injuries is comparatively higher than TL injuries since cervical injuries are often associated with more grievous head injuries and are thus likely to be missed. Poonnoose et al. had studied 52 cases of missed spinal cord injury in a large center for spinal cord injuries and observed that 36% occurred in the TL spine. In another epidemiological study from North America, the incidence of missed or delayed diagnosis of TL fractures was 16.5%. In India, the reported incidence of spinal cord injuries with delayed presentation is 26%. The definition of a spinal injury with delayed presentation is unclear as different studies have adapted different criteria to define the time lag from the time of injury to the initial presentation for definitive treatment. This includes a time scale varying between 3 and 4 weeks in retrospective analyses of neglected spinal cord trauma, and more broadly in one study, it has been quoted as any injury which has not received timely treatment., Chhabra and Arora in their study observed a delay ranging from 4 weeks to 676 weeks, with 4–8 weeks delay in 29.5%, 8–24 weeks delay in 21.3%, and more than 24 weeks delay in 49.2%. Khatri et al. had reported on 40 patients with neglected TL trauma where they had adapted 3 weeks as the cutoff time limit because the authors felt that in majority of the cases, 3 weeks is the time at which fibrosis sets in around the injured vertebral segment and makes operative intervention difficult. The causes of delayed presentation of TL injuries are varied. In underdeveloped/developing regions of the world, the reasons would encompass overlooked diagnosis by the initial treating physician, inadequate treatment, undertaking a native method of treatment, and inaccessible healthcare. Khatri et al. in their retrospective series observed that inadequate primary treatment at the initial treatment center (45%) was the most common cause for delayed presentation while late presentation by the patient (38%) and missed injury (17%) were the other major reasons. In patients with missed injury, associated head injury or polytrauma were considered as the reasons for missing the diagnosis. The scenario is different in the developed countries where polytrauma and distracting injuries are the common causes of delayed management of TL fractures. Poonnoose et al. had reported the incidence of missed injuries at 36% in TL spine. In one of the early studies by Anderson et al., of the 181 patients with major TL fractures, 43 were diagnosed late or missed in the emergency room. In 33 patients, the injury was missed because it occurred in unstable patients requiring emergent medical imaging and/or operation, and in 7, the emergency physicians had failed to detect fractures on radiographs, and 3 occurred in stable patients who were not radiographed. The authors also noted that the delayed group were more often critical, hypotensive and had lower Glasgow Coma Scale scores than did the nondelayed group. The authors had concluded that the cases of missed injuries could be prevented by adhering to protocols in initial clinical assessment and radiological evaluation. Krueger et al. reported a 11% incidence of missed injuries and advised computed tomography (CT) of the whole spine in unstable patients to avoid missing an occult spinal injury. Other studies have advised imaging of the whole spine to avoid missing spinal fractures. Kanna et al. had reviewed 484 patients with spinal injuries and noted that 95 (19.62%) patients had multilevel injuries including 86 (17.76%) with noncontiguous injuries. Whole spine magnetic resonance imaging (MRI) scan detected 24 (28.6%) missed secondary injuries of which 5 were unstable. Hence, the authors stressed the need for a whole spine sagittal imaging to prevent missed injuries. A point is to be made to highlight the possibility of missed injuries in patients with ankylosing spondylitis. In patients with fused spine, a trivial fall can induce a two-column fracture of the spine, which are difficult to detect in conventional radiographs. In such patients, CT scan would be the ideal investigation [Figure 1] and should be performed with a low threshold to avoid missed injuries of the spinal column. Similarly, only about 30% of osteoporotic vertebral fractures are recognized at the time of injury, and most of the “clinically silent” fractures heal without untoward sequalae. In a study, Gehlbach et al. observed that one or more asymptomatic vertebral fractures were noted in 14% of 934 chest X-ray films obtained in women age 60 years and older. Patients with known TL injury but deferred a definitive treatment for their injury for socioeconomic reasons may or may not have neurological deficit. However, in patients with missed initial diagnosis, the neurological integrity is generally maintained. Most of the vertebral injuries are either unstable burst fractures or rarely fracture dislocations. Compression fractures and stable burst fractures, which generally do not require surgical intervention, are not included in studies on missed spinal injuries. Patients have reasonably good outcomes with these injuries, even if missed. The pathophysiology of sequelae arising from delayed management of TL fractures can be divided into bony changes and neurological changes. Typically, neglected TL injuries can lead to progressive kyphotic deformity. Since fractures predominantly involve the anterior column, the transfer of normal biomechanical stresses leads to progressive vertebral collapse and kyphosis., This can be accentuated in patients with posterior ligamentous disruption, osteoporosis, and inadequate immobilization. In patients with translational injuries, further displacement of vertebral bodies in the sagittal and coronal planes can lead to significant deformities [Figure 2]. Such deformities are to be considered in the surgical planning since complex surgical releases, combined anterior and posterior procedures, osteotomies, and spinal canal decompression would be required for optimal surgical outcomes. Secondary pathological changes may occur in the neural elements also. The presence of retropulsed bone fragments with canal compromise and vertebral instability due to the unfixed spinal column results in progressive fluid accumulation and cystic changes within the spinal cord, resulting in the development of posttraumatic syringomyelia (PTS)., PTS has a prevalence of 3.2%–40%. PTS can result in neurologic deterioration after an initial improvement or plateauing of neurologic function. Even in the absence of syrinx formation, the presence of residual cord compression and instability can result in progressive loss of neurologic function. This is especially seen in the setting of a significant posttraumatic kyphotic deformity. The secondary problems related to prolonged recumbency include development of pressure sores, gross muscle wasting, contractures of the muscles, fixed deformities of the joints due to capsular contractures and myositis, deep venous thrombosis, chest infection, urinary tract infection, and poor nutrition. In a retrospective study of 40 patients with delayed presentation, the authors noted that the most common complication encountered in the management was pressure sores, which was present in 58% of cases. Constipation (54%), urinary tract infection (42%), depression (38%), and deep vein thrombosis (26%) were present in a substantial number of cases. The common triad of clinical presentation in patients with delayed presentation is pain, deformity, and neurological deficit. Axial pain localized to affected zone or in the loin region is a common presentation. The treating physician should be cognizant to localize the pain generator. When offering surgery for pain relief, it is imperative that the pain generator be accurately identified so that the appropriate surgery is performed. The pathogenesis of pain can be related to the unstable spinal segment, pseudoarthrosis, kyphotic deformity, or progressive degenerative changes that occur over time secondary to injury. Pain related to unstable spinal segment is typically aggravated with movements after a period of rest or a change in posture. Pseudoarthrosis has a similar clinical presentation but is easily diagnosed with MRI. Kyphotic deformity localized to the afflicted segment is felt as a knuckle deformity. The pain arising due to kyphosis is considered to be caused by postural muscle fatigue. A thorough and detailed neurological evaluation is mandatory to document the exact neurological status. Since joint contractures are common, adequate physiotherapy has to be planned for mobilizing the hip, knee, and ankle joints. Pressure sores can be present in the sacrum, occiput, and the trochanters and if deep, may require a thorough assessment by plastic surgeons. Pulmonary infections and urinary tract infections need to be checked for before planning the definitive surgery. Standard anteroposterior and lateral radiographs are the initial evaluation used in assessing the injury. In patients with posttraumatic kyphosis, a standing lateral radiograph of the whole spine is performed to assess the global sagittal balance, compensatory mechanisms in the adjacent segments, and severity of the deformity. CT scan of the fractured segment is useful to evaluate the extent of the fracture, assessing retropulsed bone fragments, and in junctional hidden regions of the spine (cervicothoracic) which are better assessed in the CT. MRI is performed if there are clinical features of spinal cord compression and in patients with suspected vertebral body pseudoarthrosis to identify fluid collection [Figure 3]. Two column injuries, translational injuries, unstable fractures with retropulsed bone fragments, kyphotic deformity more than 30° and presence of neurological deficit are standard indications of surgery., In relatively recent injuries, axial pain due to the instability of fracture and neurological deficit are defined surgical indications [Figure 4]. However, in chronic injuries with healed fractures, often kyphosis and axial back pain are the cardinal symptoms. Surgeries for posttraumatic spinal deformities are complex procedures with a significant morbidity and risk for major complications including neurological injury. It is therefore important to ascertain the need and goals for surgery. While pain arising due to spinal instability and pseudoarthrosis respond very well to surgical management, there is no direct relationship between the severity of posttraumatic kyphosis and back pain.,, This is especially true in patients with a healed kyphotic fracture without any neurological findings but presenting with axial pain. Conventionally, there is an increased risk for chronic pain in kyphotic deformity of >30°, and hence, such deformities at the TL junction could benefit from surgical intervention. In some patients, mechanical pain may occur in the lumbar region secondary to the compensatory hyperlordosis below the kyphotic segment and such patients may benefit from kyphosis correction. Surgery for purposes of neurological recovery in chronic neglected spinal injuries is controversial. Patients present with various degrees of neurological deficit and the exact role and indications for surgery are not clearly defined in literature. There is literature evidence to suggest that patients with neurological deficits may benefit from improved neurological function even from late decompression;, however, there are no defined timelines beyond which surgery may not be beneficial to the patient. Neurological recovery after a decompressive procedure in the setting of an incomplete neurological deficit in TL injuries has been reported even as late as 2 years after injury. Maiman et al. reported on 20 patients with incomplete TL spinal cord injuries who were treated with anterior decompression and fusion at a mean delay of 23 months after injury and the authors reported on 17 patients who had substantial neurological improvement. The goals of treatment in delayed TL trauma are to provide stability, relieve neurological compression, and correct deformity. This can be achieved by posterior pedicle screw-based stabilization and fusion with or without corrective osteotomies, anterior decompression and fusion, and combined anterior-posterior techniques. While most of the goals can be achieved by an all posterior approach, in patients with neurological deficit secondary to retropulsed bone fragments, an anterior procedure may be warranted. Anterior techniques include anterior corpectomy, correction of deformity and stabilization with a strut graft, or cage devices with a graft. Many authors had reported successful results from anterior decompression and stabilization with the use of anterior instrumentation for posttraumatic kyphosis. Early reports on the treatment of posttraumatic kyphosis were anterior only procedures and the goals of surgery were reducing the pain and neurological improvement, with less emphasis on deformity correction.,, Malcolm et al. reported on 48 patients who underwent an anterior decompression without instrumentation for posttraumatic kyphosis. They achieved only a 26% correction of deformity with a high-failure rate of 50%. The anterior approach also has the disadvantages of approach-related morbidity. The deformity can be corrected better by combined anterior and posterior approaches. McAfee et al. stated that anterior decompression and fusion alone were not suitable to correct a rigid kyphosis and a combined anterior and posterior procedure was preferable. Böhm et al. using a combined posterior decompression and fixation and anterior corpectomy and grafting achieved a mean of 22.5° of kyphosis correction while 30% of patients had an improvement in neurological status. However, the disadvantages of combined procedures are the need for two surgical approaches, increased blood loss, higher rates of infection and prolonged surgical time and approach-related complications. Of late, there is a growing trend for correction and stabilization by an all-posterior only approach., The advantages include the familiarity of approach, direct access to the apex of the deformity and ability to achieve circumferential decompression of the cord. While stability is achieved by pedicle screw fixation and rods, for the correction of posttraumatic kyphotic deformities, various osteotomies including Ponte osteotomy, posterior closing wedge osteotomy [Figure 5] and closing-opening wedge osteotomy [Figure 6] have been described. Lehmer et al. achieved a mean correction of 35° using posterior closing wedge osteotomy in 38 patients with posttraumatic kyphosis including 8/14 patients who showed an improvement in neurological status. Suk et al. had compared the results of the combined anteriorposterior surgery with that of a posterior closed wedge osteotomy in the correction of posttraumatic kyphosis. They concluded that the posterior closed wedge osteotomy procedure gave better surgical results with reduced operating time and less blood loss. For severe kyphotic deformities, a more extensive vertebral column resection would be required. Kawahara et al. described the closing–opening wedge osteotomy to correct severe posttraumatic kyphosis in five patients, where the average preoperative kyphosis improved from 63° to 14° postoperatively. The technique involves circumferential decompression of the cord around the kyphosis, anterior opening using a cage, and posterior closure of the osteotomy using pedicle screws and rods. Neglected TL injuries are rare clinical situations and their etiologies vary in different regions of the world. In developing countries, the reasons include misappropriate initial treatment and delayed presentation for treatment, while in developed countries, it is usually missed injuries. The clinical symptoms include axial pain, kyphotic deformity, and neurological deficit. Management of neglected traumatic spinal injuries is challenging with respect to intraoperative difficulties, higher incidence of intraoperative and postoperative complications, and subsequent rehabilitation. Various surgical options are available, and the posterior approach which enables deformity correction and circumferential fusion is currently gaining popularity while the anterior approach is advocated in patients with neurological deficit secondary to bony spinal cord compression. Jain AK, Dhammi IK, Singh AP, Mishra P. Neglected traumatic dislocation of the subaxial cervical spine. J Bone Joint Surg Br 2010;92:246-9. Sengupta DK. Neglected spinal injuries. Clin Orthop Relat Res 2005;(431):93-103. Reid DC, Henderson R, Saboe L, Miller JD. Etiology and clinical course of missed spine fractures. J Trauma 1987;27:980-6. Poonnoose PM, Ravichandran G, McClelland MR. Missed and mismanaged injuries of the spinal cord. J Trauma 2002;53:314-20. Meldon SW, Moettus LN. Thoracolumbar spine fractures: Clinical presentation and the effect of altered sensorium and major injury. J Trauma 1995;39:1110-4. Chhabra HS, Arora M. Demographic profile of traumatic spinal cord injuries admitted at Indian spinal injuries centre with special emphasis on mode of injury: A retrospective study. Spinal Cord 2012;50:745-54. Goni V, Gopinathan NR, Krishnan V, Kumar R, Kumar A. Management of neglected cervical spine dislocation: A study of six cases. Chin J Traumatol 2013;16:212-5. Khatri K, Farooque K, Sharma V, Gupta B, Gamanagatti S. Neglected thoraco lumbar traumatic spine injuries. Asian Spine J 2016;10:678-84. Anderson S, Biros MH, Reardon RF. Delayed diagnosis of thoracolumbar fractures in multiple-trauma patients. Acad Emerg Med 1996;3:832-9. Krueger MA, Green DA, Hoyt D, Garfin SR. Overlooked spine injuries associated with lumbar transverse process fractures. Clin Orthop Relat Res 1996;327:191-5. Kanna RM, Gaike CV, Mahesh A, Shetty AP, Rajasekaran S. Multilevel non-contiguous spinal injuries: Incidence and patterns based on whole spine MRI. Eur Spine J 2016;25:1163-9. Rajoli SR, Kanna RM, Aiyer SN, Shetty AP, Rajasekaran S. Circumferential fusion through all-posterior approach in Andersson lesion. Asian Spine J 2017;11:444-53. Gehlbach SH, Bigelow C, Heimisdottir M, May S, Walker M, Kirkwood JR. Recognition of vertebral fracture in a clinical setting. Osteoporos Int 2000;11:577-82. Munting E. Surgical treatment of post-traumatic kyphosis in the thoracolumbar spine: Indications and technical aspects. Eur Spine J 2010;19 Suppl 1:S69-73. Been HD, Poolman RW, Ubags LH. 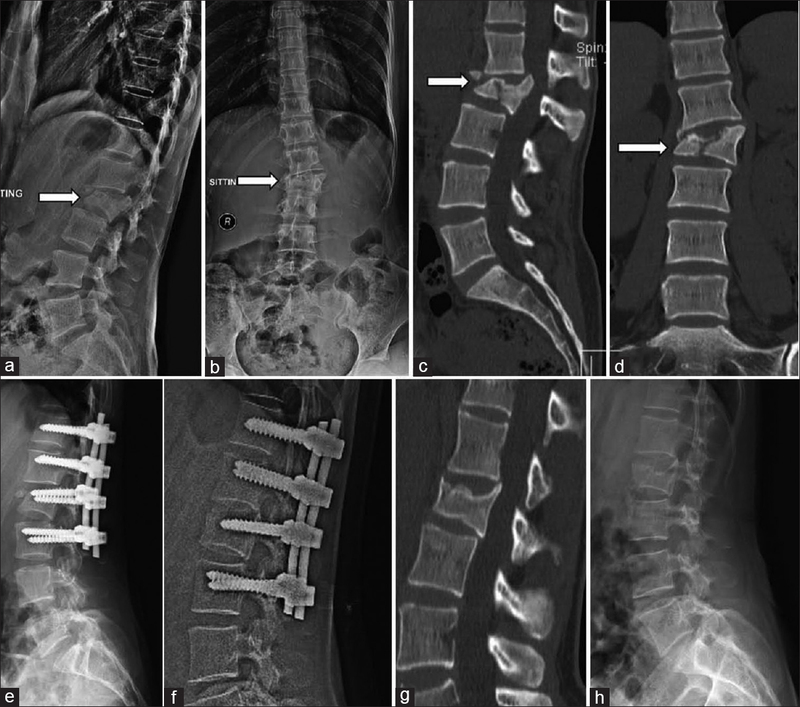 Clinical outcome and radiographic results after surgical treatment of post-traumatic thoracolumbar kyphosis following simple type A fractures. Eur Spine J 2004;13:101-7. Curati WL, Kingsley DP, Kendall BE, Moseley IF. MRI in chronic spinal cord trauma. Neuroradiology 1992;35:30-5. Lee TT, Alameda GJ, Gromelski EB, Green BA. Outcome after surgical treatment of progressive posttraumatic cystic myelopathy. J Neurosurg 2000;92:149-54. 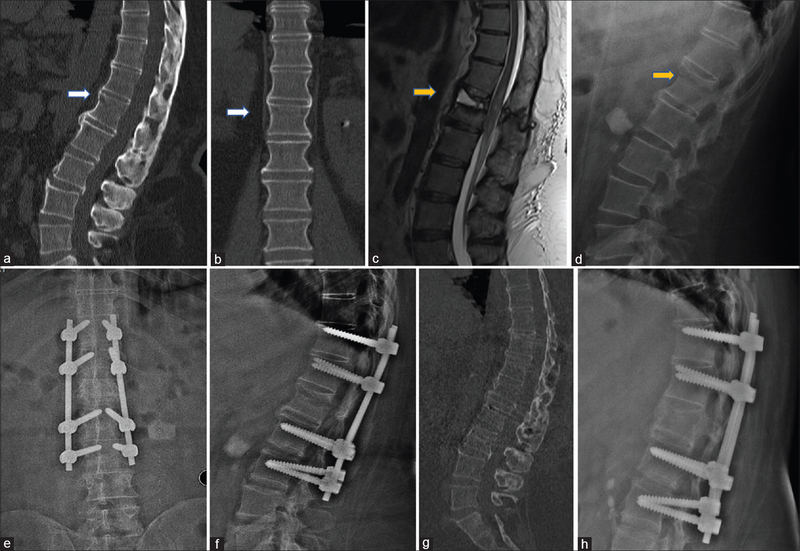 Abel R, Gerner HJ, Smit C, Meiners T. Residual deformity of the spinal canal in patients with traumatic paraplegia and secondary changes of the spinal cord. Spinal Cord 1999;37:14-9. Gertzbein SD, Harris MB. 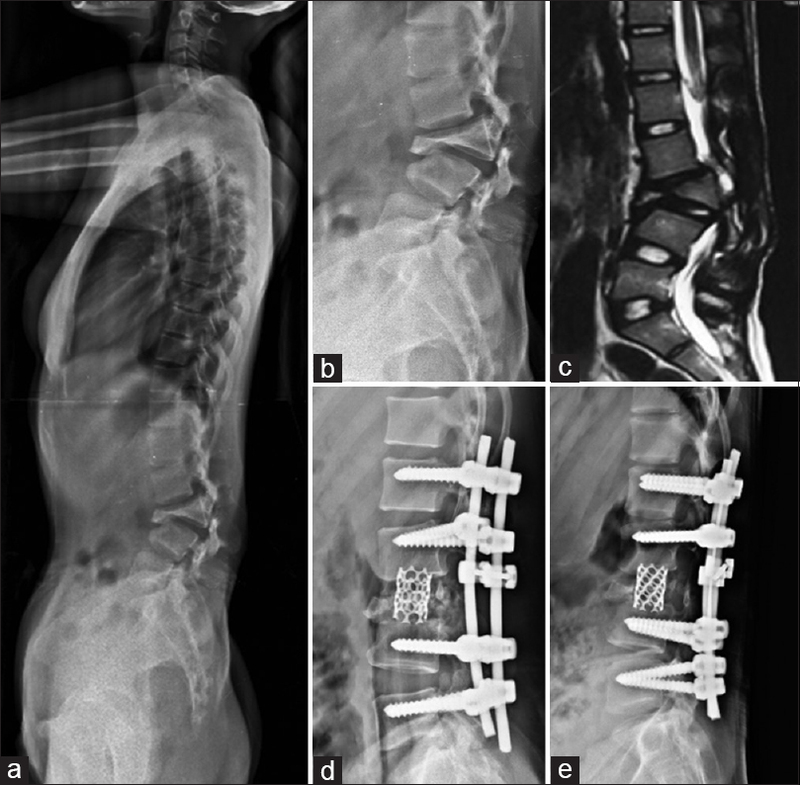 Wedge osteotomy for the correction of post-traumatic kyphosis. A new technique and a report of three cases. Spine (Phila Pa 1976) 1992;17:374-9. McKinley W, Meade MA, Kirshblum S, Barnard B. Outcomes of early surgical management versus late or no surgical intervention after acute spinal cord injury. Arch Phys Med Rehabil 2004;85:1818-25. Malcolm BW, Bradford DS, Winter RB, Chou SN. Post-traumatic kyphosis. A review of forty-eight surgically treated patients. J Bone Joint Surg Am 1981;63:891-9. Cantor JB, Lebwohl NH, Garvey T, Eismont FJ. Nonoperative management of stable thoracolumbar burst fractures with early ambulation and bracing. Spine (Phila Pa 1976) 1993;18:971-6. Mumford J, Weinstein JN, Spratt KF, Goel VK. Thoracolumbar burst fractures. The clinical efficacy and outcome of nonoperative management. Spine (Phila Pa 1976) 1993;18:955-70. Wu SS, Hwa SY, Lin LC, Pai WM, Chen PQ, Au MK. Management of rigid post-traumatic kyphosis. Spine (Phila Pa 1976) 1996;21:2260-6. McAfee PC, Bohlman HH, Yuan HA. Anterior decompression of traumatic thoracolumbar fractures with incomplete neurological deficit using a retroperitoneal approach. J Bone Joint Surg Am 1985;67:89-104. Bohlman HH, Kirkpatrick JS, Delamarter RB, Leventhal M. Anterior decompression for late pain and paralysis after fractures of the thoracolumbar spine. Clin Orthop Relat Res 1994;(300):24-9. Maiman DJ, Larson SJ, Benzel EC. Neurological improvement associated with late decompression of the thoracolumbar spinal cord. Neurosurgery 1984;14:302-7. Böhm H, Harms J, Donk R, Zielke K. Correction and stabilization of angular kyphosis. Clin Orthop Relat Res 1990;(258):56-61. Transfeldt EE, White D, Bradford DS, Roche B. Delayed anterior decompression in patients with spinal cord and cauda equina injuries of the thoracolumbar spine. Spine (Phila Pa 1976) 1990;15:953-7. Kawahara N, Tomita K, Baba H, Kobayashi T, Fujita T, Murakami H. Closing-opening wedge osteotomy to correct angular kyphotic deformity by a single posterior approach. Spine (Phila Pa 1976) 2001;26:391-402. Lazennec JY, Neves N, Rousseau MA, Boyer P, Pascal-Mousselard H, Saillant G. Wedge osteotomy for treating post-traumatic kyphosis at thoracolumbar and lumbar levels. J Spinal Disord Tech 2006;19:487-94. Lehmer SM, Keppler L, Biscup RS, Enker P, Miller SD, Steffee AD. 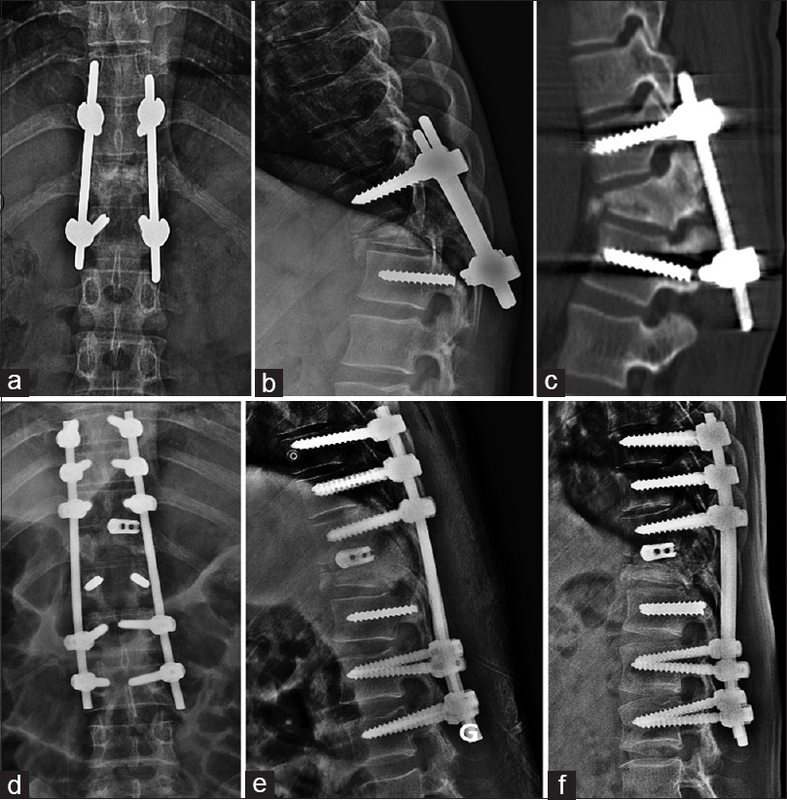 Posterior transvertebral osteotomy for adult thoracolumbar kyphosis. Spine (Phila Pa 1976) 1994;19:2060-7. Suk SI, Kim JH, Lee SM, Chung ER, Lee JH. Anterior-posterior surgery versus posterior closing wedge osteotomy in posttraumatic kyphosis with neurologic compromised osteoporotic fracture. Spine (Phila Pa 1976) 2003;28:2170-5.